As winter’s last gasp of cold air descends on Ottawa, so, too, has speculation over the expulsion of Senator Don Meredith from the upper chamber over his misuse of Senate resources in carrying out an extra-marital affair, which brought the Senate of Canada into disrepute. 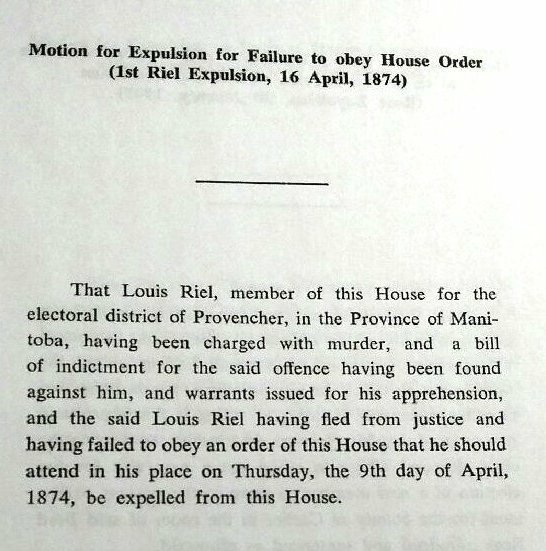 Some of my correspondents have informed me that the talk within the Senate of Canada’s administration is that a Senator could only be expelled for one of the reasons listed in section 31 of the Constitution Act, 1867. I believe that this is false. The grounds for expulsion listed in section 31 as “Disqualifications of Senators” — failing to attend two consecutive sessions of a parliament, becoming a citizen of “a foreign power,” going bankrupt, being convicted of a felony (i.e., an indictable offence in today’s terms) or being attained of treason, or for failing to uphold the residency requirement — are obligatory, but they should not be regarded as an exhaustive list. The well-established principles of parliamentary privilege mean that any legislative body (i.e., a house of parliament) like the House of Commons or the Senate possesses the authority to discipline or even expel its members. This authority flows from section 18 of the Constitution Act, 1867, section 4 of the Parliament of Canada Act (which itself derives from section 18 of the Constitution Act, 1867), as well as centuries of recognition in the courts and parliamentary precedent and practice. The case for the expulsion of Senator Meredith could hinge upon his having committed a contempt of parliament rather than having breached a specified privilege, because “a contempt is any conduct which offends the authority or dignity” of the legislative body. The procedure for expulsion takes two forms. 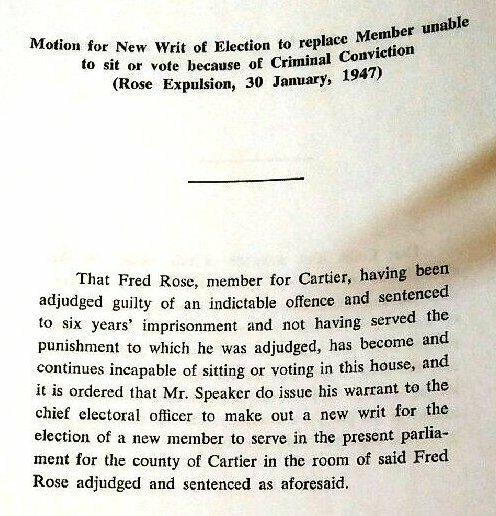 The expulsion of a member would occur automatically pursuant to section 750(1) of the Criminal Code if a member has been convicted of a criminal offence; in the House of Commons, the chamber would adopt a motion calling for a writ of election for the affected riding. A by-election would then be held in accordance with the Canada Elections Act. 750 (1) Where a person is convicted of an indictable offence for which the person is sentenced to imprisonment for two years or more and holds, at the time that person is convicted, an office under the Crown or other public employment, the office or employment forthwith becomes vacant. Cases which would not result in automatic expulsion would follow a longer process. First, a members would vote on a motion to refer the allegations against the member to a committee, which would then examine the charge. If the committee’s report upholds the charge, then a member (usually a Minister of the Crown) would move a separate motion for the expulsion of the offending member. If that motion passes by simple majority, then it promulgates the expulsion of the offending member into force, and his seat is thereby vacated. A by-election would then be held in accordance with the Canada Elections Act. Louis Riel holds the singular distinction of having been expelled from the House of Commons twice. After his first expulsion, he ran in the by-election held in his riding, and the voters of Provencher, Manitoba re-elected him. The House of Commons then expelled him for the second and final time. Thomas McGreevy was expelled for having refused summons to the Commons. Fred Rose, a Communist who passed Canadian state secrets to the Soviet Union, was expelled after having been convicted of treason. The Appendices of the Manual of Official Procedure of the Government of Canada provide the motions that promulgated the expulsions of Louis Riel, Thomas McGreevy, and Fred Rose. Since Senator Meredith has not even been charged with, let alone convicted of, a criminal offence, the first procedure relative to section 750(1) of the Criminal Code would not apply. The Senate would therefore have to follow the second procedure. 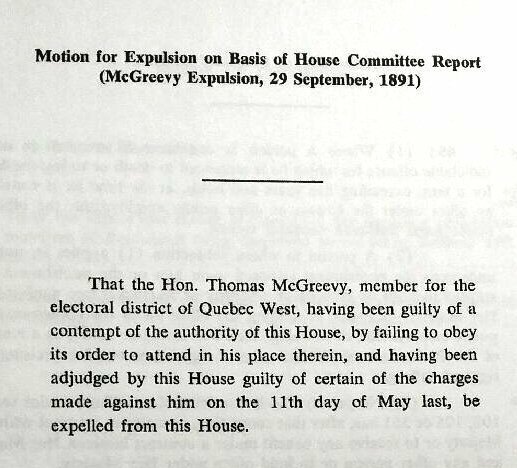 Of the four precedents of expulsion from the Commons, the motion to expel Meredith would most resemble that for Thomas McGreevy’s “having been found guilty of a contempt of the authority of this House.” The Senate could substitute “dignity” for “authority” in its motion. In principle and under under section 18 of the Constitution Act, 1867 and section 4 of the Parliament of Canada Act, the Senate as a legislative body possesses this same collective parliamentary privilege as does the House of Commons. Consequently, neither the House of Commons alone nor the Senate alone could expand their own privileges as legislative bodies; only the Parliament of Canada (i.e, Queen, Senate, Commons) could create new or expand existing privileges through statute, or through a Section 44 Constitutional Amendment, which Parliament can pass alone. (For instance, Parliament could amend section 18 and strike out the bizarre proviso that parliamentary privilege in Canada only exists to the extent that parliamentary privilege existed in the United Kingdom at a certain date on the grounds that this provision is now inconsistent with Canada’s status post-1931 as an independent, sovereign state). Quite simply, there is no impediment to putting that principle into practice. The Senate’s collective parliamentary privilege as a legislative body allows it to expel its members for reasons other than those listed in section 31 of the Constitution Act, 1867, provided that it follows the proper procedures in accordance with its Standing Orders. If the Senate expelled a member, then his seat would become vacant, and the Prime Minister could advise the Governor General to summon someone else to take his place, pursuant to sections 32 and 24 of the Constitution Act, 1867. As a constitutional matter, the Senate of Canada possesses the authority to expel Senator Meredith for reasons other than those listed in section 31. As a political matter, the Senate of Canada must now decide whether or not it should exercise its authority of expulsion. House of Commons, Privilege in the Modern Context (Ottawa: Table Research Branch, June 1990), 7. House of Commons, Privilege in the Modern Context (Ottawa: Table Research Branch, June 1990), 6. Canada. Privy Council Office, Manual of Official Procedure of the Government of Canada, Henry F. Davis and André Millar. (Ottawa: Government of Canada, 1968): 239-242. Canada. Privy Council Office, Manual of Official Procedure of the Government of Canada: Appendices, Henry F. Davis and André Millar. (Ottawa: Government of Canada, 1968): 359, 360, 361. In 1968, it was section 654 of the Criminal Code that provided for the automatic expulsion of members convicted on treason. Today, section 750(1) of the Criminal Code provides the equivalent function, though it has expanded the grounds from expulsion so that they now cover any conviction for a criminal offence and not only treason. House of Commons, Privilege in the Modern Context (Ottawa: Table Research Branch, June 1990), 2, 4. The Senate was intended from the outset to be a body independent from outside interference, and so I therefore propose 90% support for such an expulsion. Regarding Section 44 of the Constitution Act 1982; keep in mind that under the Supreme Court Judgment in Case Number 35203 (2014 SCC 32), entitled “Reference re Senate Reform” and delivered on April 25th 2014, the Parliament’s power to make Constitutional Amendments under S. 44 was diminished. I must take this occasion to boast about the fact that I had the great honour of getting rid of a worthless Canadian Senator back in 1998! Below is my February 4th 1998 Fax Letter to Prime Minister Jean Chrétien regarding a worthless Senator Andrew Thompson who was living in Mexico! HA! HA! HA! (Nobody actually knew how long he was living in Mexico!) Prior to my Letter, PM Chrétien insisted for months that nothing could be done, but then after my Letter he announced that he convinced Senator Thompson to resign. He of course gave no credit whatsoever to me! I wasn’t happy with the resignation because that enabled Senator Thompson to keep his big fat Senatorial Pension which I wanted him to lose. As a side note; I just want to clarify the confusion regarding Section 18 of the BNA Act — which had been replaced by the Parliament of Canada Act 1875 (U. K.). The proviso respecting the Canadian Parliament’s privileges not exceeding those of the Westminster Parliament — as would exist at the time of the passing of the pertinent Act of the Parliament of Canada — is now SPENT and without effect. (The original Section 18 was locked into March 29th 1867.) This proviso became spent with Section 2 of the Statute of Westminster 1931 (enacted December 11th). Section 2 formally terminated any privileges of the Westminster Parliament over Canada. The Right Honourable Jean Chrétien, P.C., M.P. Re: Ridding and Retaining Senators. Andrew Thompson. Well, if nobody in Ottawa is up-to-date on their Constitution, Section 31 of the British North America Act provides for getting rid of useless Senators. In particular, Cases 2 & 5 would apply to Andrew Thompson. Case 5 makes a Senate seat vacant if the Senator ceases to be a resident of his appointed Province. I believe that Thompson has a home in Mexico. With this Senator Thompson living down in Mexico — and even owning a house there — he cannot be considered a resident of Ontario! Furthermore, Case 2 disqualifies a Senator if he does an Act to become entitled to any right or privilege of a foreign country. Surely this Thompson must have applied for a health card or driver’s license or some privilege of a citizen of Mexico! For Thompson’s seat to become vacant, the Governor General could declare his seat vacant, and simply appoint a new Senator. It would then be the burden of Thompson to apply to the courts to try to keep his seat. If Thompson doesn’t get kicked out of the Senate, he retires therefrom in less than two years, and then he gets a big fat senatorial pension! I feel that he’s stolen from the taxpayers long enough, and it is now high time that he and the other bums in the Upper House get kicked out! Regarding the retention of those few exceptional Senators, I’m wondering if either you, or any of your predecessors for that matter, are aware that the Senate retirement provision enacted in 1965 does not prohibit the appointment of someone 75 years or older. A Senator appointed after age 75 would then serve for life or until voluntary retirement through resignation. This could be done to retain a current Senator — forced to retire at age 75 — by re-appointing him the day after his birthday. This can be easily justified as it saves the cost of his Senatorial pension! Such an extension may not be desired for many Senators, but there are those few (like Jacques Hébert who retires in June) who are invaluable. You also need to note Section 29 of the BNA Act. The matter of expulsion is categorically ruled out by Subsection 29(1) “a Senator shall, subject to the provisions of this Act, hold his place in the Senate for life”. There are no extra-constitutional options available. 1. Section 18 is a provision of the Constitution Act, 1867. 2. Section 18 says that both the Canadian House of Commons and Senate derive their privileges from the British House of Commons, which means that the two Canadian houses have the same privileges. 3. The British House of Commons’s collective privileges included expulsion. 4. Therefore, both the House of Commons and Senate possess the collective parliamentary privilege to expel members. I’m afraid that you’re misinterpreting the purpose of Section 18. Section 18 is not about empowering Parliament to ‘constitute’ the Senate and House of Commons. The purpose of this provision is to empower Parliament to accord some legal powers to the Senate and Commons individually, and to individual Members of each House — such as administering Oaths or hiring employees. This provision also enables the exemption of Members from Executive Orders, Provincial Laws, Municipal By-Laws and Provincial Courts under Section 96. This permits Parliament to exempt its Members from anything from slander and libel to parking tickets to subpoenas to appear in Court. This is what parliamentary immunity is about. It is Section 41 of the BNA Act which empowers Parliament to expel a Member of the House of Commons, but NOT the Senate. The Senate is modelled on the House of Lords. Take careful note of what you have pointed out: only the British House of Commons — not the Lords — has exercised the power of expulsion. This is affirmed by Section 41. Section 18 says that BOTH the House of Commons AND the Senate derive their privileges from the British House of Commons. The Senate therefore derives its privileges from the British House of Commons, not from the House of Lords. In addition, Section 41 has nothing to do with the House of Commons’s authority to expel members. And it is spent now anyway; what it once covered is now occupied by the Canada Elections Act. James; Section 41 is not spent, and I don’t even comprehend why you would say that. Section 41’s proviso for “the vacating of Seats of Members” includes expulsion, and it is S.41 which provides the authority for Parliament to enact the Canada Elections Act. Section 41 is the main provision which empowers Parliament to ‘constitute’ the House of Commons. Section 18 is not intended for empowering the constitution of the Senate nor Commons, and I’m afraid you’re over-interpreting what this Section means. S.18 originally clarified that Canada was part of the British Empire, and so the Parliament of Canada could not empower itself beyond the Imperial Parliament. The fact that S.41 deals with the vacating of Commons Seats intrinsically means that S.18 is NOT intended to redress this matter. If S.18 had been intended to provide for the constitution of the Commons, then S.41 would not even exist since it would be part of S.18. The fact that there is no equivalent of Section 41 for the Senate is the proof that the Parliament of Canada is not empowered to displace Sections 21 to 36 of the BNA Act. As I previously noted; the Written Law displaces Common Law, but you are arguing the reverse is true for Section 18. You seem to be afraid of a lot of things. And, to be honest, I’m getting very bored with this now, and I will soon exercise my authority to prorogue or dissolve comments. You’re already ignoring the clear and obvious facts, like how the Senate of Canada’s privilege derives from the British House of Commons and not the House of Lords. Why do I say that section 41 is spent? Because the Department of Justice’s consolidations of the Constitution Acts have mentioned this fact for decades, since at least the 1950s. Go to the Department of Justice’s website and download the latest consolidation of the Constitution Acts. Then look at the footnote 22, which refers to section 41: “Spent. Elections are now provided for by the Canada Elections Act.” The opening line of Section 41 says “until the Parliament of Canada otherwise provides.” Well, it has long since otherwise provided in the Dominion Elections Act, now the Canada Elections Act. “Vacating of seats” does not necessarily refer to expulsion based on the Commons’s collective parliamentary privilege, which is an authority ultimately derived from section 18 and past Canadian usage. Seats can be “vacated” for various other reasons like death or resignation. At any rate, the Canada Elections Act now outlines the procedures for issuing writs of election under all circumstances, including expulsion, as I said very clearly in the original blog entry. In 1867, section 41 existed in order to provide for the continuity of law from the Province of Canada to the Dominion of Canada. So did various other sections of the BNA Act which contain the words “continuity,” “continue,” or “continuance.” It accomplished its original purpose and is now spent. I have no clue whatsoever what you’re talking about regarding me being “afraid”. In any event, Section 41’s opening proviso “Until the Parliament of Canada otherwise provides” is a perpetual provision empowering Parliament to make Laws as specified in this Section — including vacating Seats, and this opening proviso is NOT spent. It is the pre-Confederation Laws which are spent. You are absolutely correct that Canada’s Parliament inherited its Privileges, Immunities and Powers from the British House of Commons, but this is Common Law which cannot be used to subvert a Written Law like Section 29 of the BNA Act. If you cannot find writings of Sir John A. Macdonald agreeing with your opinion that Section 18 authorizes expulsion of Senators, then I can assure you that such an attempted expulsion would NEVER be upheld by the Supreme Court of Canada. Read the 2014 Supreme Court Judgment on the Senate! Censorship is always the resort of those who are “afraid” of having lost an argument. In any event, we are now just talking past each other, and there’s no point to continuing our arguments. Thanks, James. I have always been bothered by the “bizarre” section 18 of the BNA Act. Glad you clarify that that could be easily changed. I wonder why it never has been? Maybe the Canadian Parliament assumes it’s not a Section 44 amendment? I seem to recall that during the Dean Del Mastro saga, the Commons considered the provisions providing for an MP’s seat to automatically become vacant following a conviction to be ineffective. Perhaps I am mistaken, but he did resign in his place in the Commons after having been convicted (though he was not yet sentenced). I wonder if a similar position would be taken in the Senate. Interesting. In that case, then perhaps the Commons and Senate would need to be more pro-active than section 750(1) of the Criminal Code and the Rose Precedent would suggest. Section 750(1) is not triggered by any old conviction. It must be a conviction on an indictable offense, and there must be a penal sanction of two years or more. In the Del Mastro case I don’t recall if the charges were pursued by indictment, but he was sentenced to one month, and as such would not have triggered 750(1). Had he been sentenced to two years or more, his seat would have been vacated had he not already resigned. I don’t remember the specifics of the case, but I am now remembering that Del Mastro was charged under the Canada Elections Act. Based on the wording of the provision, the seat does not become vacant upon conviction. It was therefore for the Commons to expel Del Mastro, had he not first resigned.